Swarupa Das, an eight standard student of Janeki Bazar ME School, Hailakandi, has emerged North East Champion in ‘Science Connect Quiz’ organised by the Department of Science and Technology, Government of India at Agartala. Eight states participated in the event. Rotary Club of Hailakandi felicitated Swarupa and presented her essential study materials and Rs.10,000. 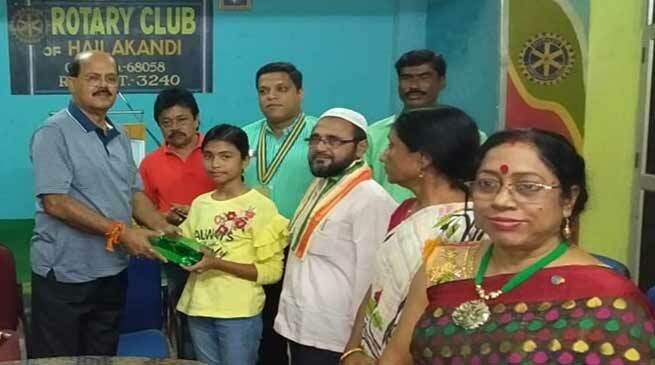 Hailing from an underprivileged family from Algapur revenue circle of Hailakandi district, Swarupa was felicitated for her remarkable achievement by Rotary Club in the presence of former minister Gautam Roy. Moreover, in the same function, Rotary Club inducted Ashish Kumar Sarkar as its new member in the presence of president Harkishore Chanda and several Rotarians. Meanwhile, Rotary Club observed World Food Day by distributing nutritious food to underprivileged and marginalised segments of the society. It also distributed clothes to the poor and needy. The organization also observed World Polio Day at SK Roy Civil Hospital on Wednesday.